How do I schedule a recurring backup using Prisma? Looking to schedule more frequent backups? Learn how to set them up with Prisma's scheduled tasks! If you're looking to run backups for your Minecraft server on a more frequent schedule, we've made it so you can create local backups on a regular schedule. Name: This can be whatever you'd like. For simplicity sake, we'll use "6h Backup"
Next Run: By default, this will be in the next minute. You can set this to whatever you'd like; Prisma will run it every 6 hours from the time that it runs next. Interval & Unit: Set this to how frequently you'd like the backups to run in a whole number (no decimals). In this case, we're going to set it to 6 hours. Status: If you'd like to pause backups for any reason, you can do so here. This is the on/off switch for scheduled tasks. Command: For backups, you'd run the Create Backup command. Arguments: For backups, this would be the directory/directories/file(s) that you'd like to backup. If you'd like for the entire server to be backed up, leave this blank. Once done, click Save Task and the backup process will begin as of your next run! Scheduled backups are extremely useful, though we understand you may still have some lingering questions... Don't worry! We're here to help! This message is actually just a standard Minecraft notification telling you that Minecraft is remembering what you're building, exploring, etc. in your world. - nothing more, nothing less. It doesn't actually backup your world or guarantee safety in the event of a TNT mishap or griefer attack. I thought CubedHost backed up my server... Why do I need to do this? First, we do backup your server! Second, you don't! The reason we offer this feature is for peace of mind. Our automated backup system runs at least once per day and retains backups for a guaranteed period up to 30 days, whereas this allows you to backup your server at a time most convenient to you on a recurring basis and you can save the files on your end for as long as you'd like. What time zone do the tasks use? Scheduled tasks will always be displayed using your local/computer time. What about all these other tasks I see in here? 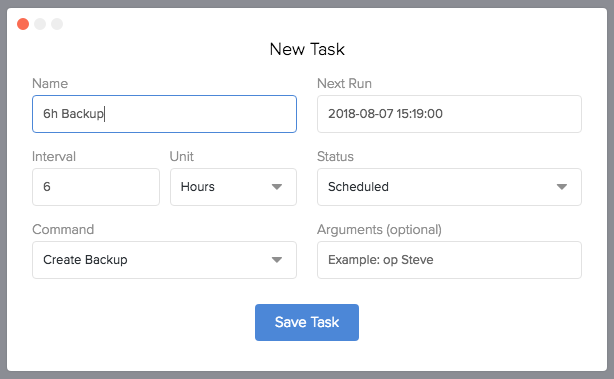 You can set up more than one task alongside your scheduled backups, such as scheduled restarts or broadcasts on your server. This guide can help.